We left home on a Friday night, heading to my parents home, in Varese, where we left the cat and we slept few hours before leaving for the airport (Malpensa is much nearer to my parents house then to our home in Milan) at 4.30 am on a Saturday. We land in Marrakech the early morning of a wonderful sunny saturday (Morocco is two hours behind Italy) and we catch the bus heading to the city. 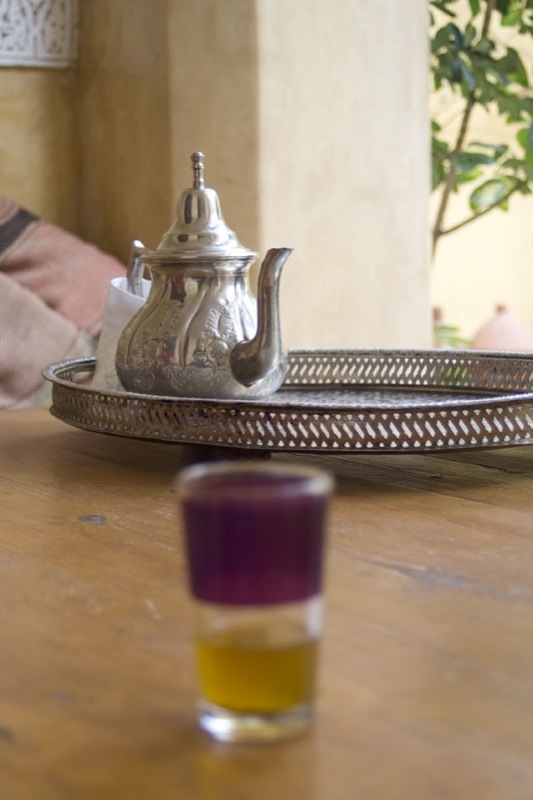 It’s a short ride, 20 minutes at most, to arrive to the souther part of the famous Place Jemaa El Fna, which we do not explore then, but we begin to look for our riad: a little treat we indulge ourselves, as it will be the most expensive of all our trip. 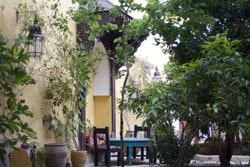 The riad is on the map of the Guide Vert Michelin, but we soon discover, in the wrong location. Really in the wrong location! And of course we were WRONG. The young guy put us in the hands of another young guy who tells us to follow him. We of course follow him. But after 20 minutes going endlessly around the labyrinth, with no clear aim and we the feeling that he’s just trying to making us feel even more lost, we decide we do not need is “help” anymore and we prefer to call the riad for specific directions. We call the riad and the gentleman on the phone tell us to wait for him in front of the “bureau de tabac” (tobacconist). Only we do not find a bureau the tabac, because the guy that was trying to “help” us listened to everything, he’s ahead of us and (supposedly) saying to everyone to give us wrong direction. We asked to the bureau de tabac if it was one, but they told us, no, sorry, we are not… But they were! From that day we learned that never, under any circumstance, you should trust anyone who’s approaching you in the street in Morocco. They seem nice, they smile at you, but all they want from you is money for nothing. They do not care about you, they do not care you are lost. They are just after your money, as a tip or a percentage on a selling or a room, in a way or another they just want your money. Sure they are not just trying to help. Anyway, after this weird start, we enter the riad, and WOW! First of all, there is silence. And then,suddenly, we are affected by what we called “The Riad syndrome”: you don’t want to go out any more. 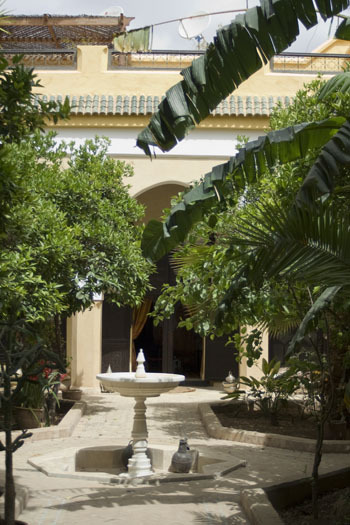 You just want to stay there, lying on the bed, or on the sofa, or on the terrace, taking a refreshing shower, or a nap, or just reading… You want the riad be your home. Forever. Anyway, we forced ourself to go out because we had to eat and to buy the ticket for next day bus to Fès. Then we head to Place Jemaa El Fna to eat. 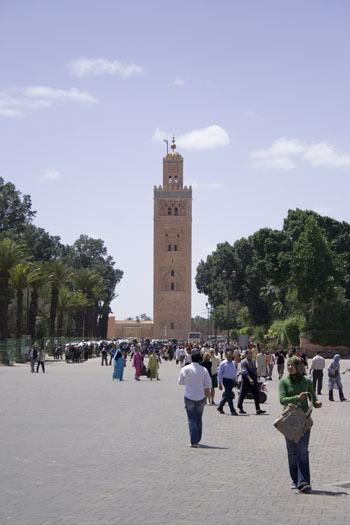 We survey some stalks (constantly harassed by everybody, trying to convince us to eat at their place) and we chose one full of Moroccan people. 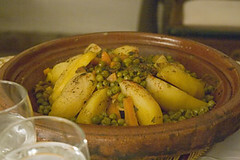 We have our first tajine de poulet au citron (Chicken with confit lemon Tajine) and grilled meat, with bread. 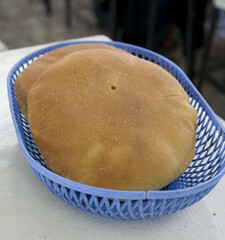 Bread was the most amazing discover of Morocco: the best we’ve ever tried! And you know why? Simple: is cooked in a wood oven. But I have time to tell you all about it! Finally we can head back to our paradise! A paradise with a kitchen, where, for not too many dirham (at least not compare to Europe, but a lot compare to the Morocco), you can have your dinner, cooked expressly for you by the riad cook (whom is normally the woman housekeeping the whole facility too). 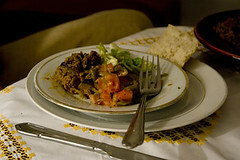 Moroccan cuisine, of corse! Salads, tajine, fruit salad, mint tea. A luxury we’ll experience again during our trip! che bellissime foto e che meraviglioso racconto! Deve essere un posto magico! The food looks wonderful but I can understand that you could get fed up if there’s not much variety. The sun looks nice too…we seem to be having a very grey spring. La prima immagine è molto bella. Prima o poi andrò anche io in Marocco. Ho ospitato in un festival una signora di Casablanca, Mina, che ci ha preparato il tè alla menta e spiegato come prepararlo. Molto buono. Peccato non so in che scatolone siano la teiera e tutto il resto, ci penserò una volta rimpatriata definitivamente. Aspetto di leggere il resto della cronaca di questo viaggio.